When birthdays or special occasions come around it always feels like forever before I can find the right gift. And while it should be very satisfying to bring home that gift, I usually feel less happy when it comes in those store-wrappings that hardly ever look pretty or inviting. So since a few months I’ve started to wrap my own gifts and I try to do so by adding a hint of personality to it – linked to the receiver of the gift or to me. I’d like to share two of my recent ones with you. My nephew’s recently turned 4 years old already! Because he has been an elephant lover for as long as I can remember we bought him an elephant book which contains actual puzzles. Even though he will most likely ignore the wrapping I like making a simple gift into something a bit more special. First things first, a rather basic wrapping of the book, though I added a little fold to hold a card. 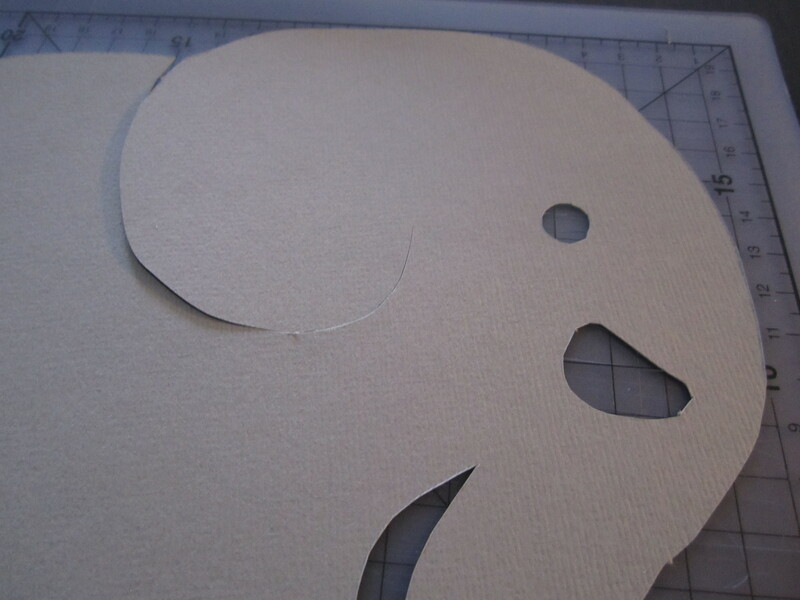 Then it was time to get started on the elephant cut-out. I taped it to the scrap booking paper to make sure it wouldn’t move, then cut it with the box cutter. I also cut out a hole for the eye and his tusk to create some colour difference as well as separated his ear so I could create some depth. After some moving of the elephant to check the best position on the package – I wanted the eye to go over one of the dark spots and the tusk to be on the clear background – I used a glue roller to stick the legs, body and head to the package. The tail, ear and snout aren’t glued as you can see. I used a pen here to curl them upwards slightly to create the depth I wanted. The orange card says “Happy Birthday from us” below the fold, but just the name sticks out so I get to ask him who the gift is for since our nephew has started writing his own name. Hope you like this idea and it might inspire you to do the same with your gifts! Another birthday calls for a cheerful wrapping method I’ve spotted via Pinterest. I decided to go with these lovely pieces of stock paper. Other things I used are cello-tape a box-cutter, cutting mat and ruler, and as a mould for the strips I used some plain old lined writing paper. Another solution would be to use a shredder! Taping the stock paper to the lined writing paper I was able to just cut over the lines, creating this lovely pile of colourful straps. The downside to this technique is that not every strip is perfectly straight because the writing paper tended to move ever so slightly while cutting. Next step would be to start weaving. I created a separate weave first before taping the first line and column to the packaged CD. I did this to create an even tighter weave. Strip by strip I glued it to the package, deciding to make the woven block not appear in the centre as shown in the source, but slightly off centre. To make sure the less pretty backside was showing I glued the CD to the book, creating this little piece of art. Doesn’t that look an awful lot nicer than just the plain green and black package? This entry was posted in Gifts and tagged cd, elephant, scrapbooking-paper. Bookmark the permalink.